Just after nine one morning Bridget Impey, Project Coordinator for Abalimi bezekhaya is on the phone in her office in Phillipi on the Cape Flats. She is talking to someone about a possible market in the well-heeled, leafy suburb of Newlands, where overflow vegetables from Abalimi-supported gardens could be sold once a week. 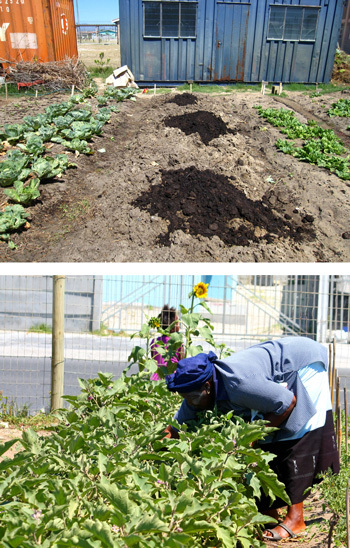 The crops in question are also harvested once a week for CSA boxes packed and distributed by Abalimi affiliate Harvest of Hope, to pick-up points in Cape Town that are geographically and economically worlds apart from the environment in which the vegetables are grown. They will be prepared and eaten in kitchens whose sizes might engulf entire homes out here on the sandy Cape Flats where corrugated iron, plastic and wood shacks remain the standard form of housing, although small brick boxes are beginning to mushroom on the sand as the challenge of building affordable and humane housing continues in the wake of Apartheid’s demise in 1994. Abalimi bezekhaya means "the planters of the home" in Xhosa. Abalimi’s primary mission is to provide training and support to individuals and community groups to create and maintain organic food growing in these impoverished areas. The goal is basic: To alleviate hunger. Once this essential need has been fulfilled, the gardens and farms ideally provide employment (the unemployment rate locally is 40%) and sustainable income. A complex system of training and support makes these gardens come true. Teaching someone to grow food is a challenge, especially if that new farmer is illiterate, as some are. The healthy vegetables I see in gardens with Bridget on her ‘picking list day’ – where she sees what will be available for next week’s CSA harvest, tells the casual observer that the business of working the soil is ticking over nicely. We travel with Joyce Camagu and Lulekwe Nbobo, assistant field support workers. While Lulekwa records quantities and crops on her clipboard, Joyce speaks in Xhosa to the farmer about what is needed, what looks good, what went wrong, and communicates any tips from Bridget who provides technical horticultural support. Leggy tomatoes in tunnels need pinching. Wilting potatoes need water. Beans are developing rust. We are seeing the gardens after the Christmas holidays, when many people return to their Eastern Cape rural family homes for a long break. It has been blisteringly hot and Bridget is worried about watering. Cape Town is in a winter rainfall region and the summers are dry, exacerbated by the seasonal buffeting southeaster which speeds up evaporation and turns sand into a scouring irritant. Boreholes tap into the massive Table Mountain Aquifer beneath the Cape Flats to irrigate the gardens, but the water table is dropping and the water is turning brown and salty. The water is being tested. Then there is the soil, which is sand. 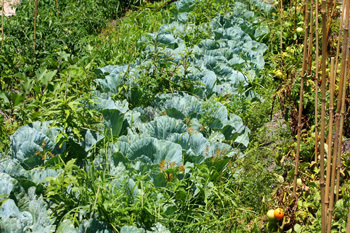 Compost is needed to create an environment where nutrient-greedy crops will grow. The company Neutrog donates one ton each month of both Rapid Raiser and Bounceback, two organic fertilizers. The concept of mulching is a new one to be implemented by the farmers, and lucerne is laid over the exposed soil to prevent excessive drying out and to return nitrogen to the crops. Some farmers view the mulch with suspicion and must be coaxed to apply it. Bean and pea crops are chopped and dug back into the soil. Repeated visits by field workers aim to allow the messages of organic gardening to sink in over time. Constant support is needed. Without it, gardens tend to perform poorly. Abalimi’s approach to ending poverty at this grassroots level is as complex as the causes of poverty itself. An intricate network of affiliates targets schools, community associations and markets. They find that women tend to produce for their families and their neighbours in need while men are more focused on economic return and work to sell their produce. Each garden that we visit is designed to support both families and the boxes that must be filled for the CSA, as well as local markets. Maintaining gardens at this level of production is a full-time and labour-intensive endeavour. Many of the farmers we meet are elderly, and hard physical labour is demanded of them daily. Inevitably some of the crops suffer. Occasionally free help arrives in the form of neighbourhood women looking to harvest ‘morog’ - edible greens usually considered weeds, such as pigweed, and young thistles. Despite the challenges, these gardens remain small fields of hope in communities where the hardship of daily life is not easily grasped by the outsider. Collard greens grown by Zimbabwean refugees who have a taste for them share plots with more familiar pumpkins, eggplants, onions, tomatoes and lettuces. Women gather around a table in the shade with small grandchildren and share meals of just-picked greens and pap (maize porridge). Protected behind razor wire or high fences on which clean wet laundry is sometimes pinned by neighbours, the gardens created by Abalimi bezekhaya are a green affirmation of the kindness of strangers and the tenacity of the human spirit. Marie Viljoen is a writer and photographer who lives in Brooklyn with her French husband and Dominican cat. She gardens on her roof and tiny terrace and blogs at 66 Square Feet and 66 Square Feet (the Food).